Abstract: This paper presents the FPGA implementation of a neurostimulator for the recovery of handicapped persons due to the damage of the central nervous system. For this implementation the mathematical model of the neurostimulator was developed and simulated using the SIMULINK package from MATLAB. 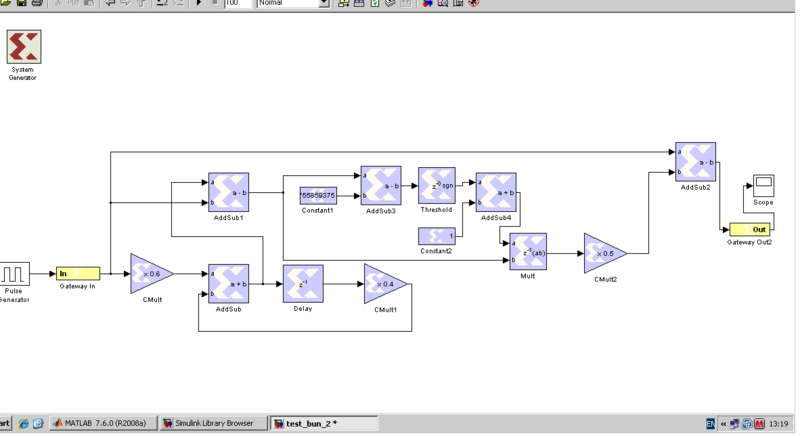 The obtained model was implemented in a FPGA circuit of SPARTAN 3E type 16,000 through the Xilinx package – System Generator. Keywords: Hardware implementation, neurostimulator, reconfigurable FPGA circuit. Decebal POPESCU, Nirvana POPESCU, Marian POBORONIUC, The FPGA Implementation of a Neurostimulator, Studies in Informatics and Control, ISSN 1220-1766, vol. 19 (1), pp. 85-92, 2010. The paper presents an interdisciplinary project (automation, mechatronics, computer science, applied neurology recovery) consisting of the development of an embedded system of neurostimulator. This system is useful for the recovery needs of handicapped persons due to damage to the central nervous system (stroke, multiple sclerosis, cerebral palsy, spinal injuries, Parkinson’s, etc.). This segment of patients represents an important limitation of autonomy as it directly affects quality of life. Neuroprosthesis, which play mobility of paralyzed subjects, are still in the prototype stage and expected new discoveries in electronic miniaturization, artificial methods of control of muscles, neurology, etc. to become used daily and with significant benefits for the user. By using the proposed embedded type neuroprosthesis, the patient will become more socially integrated, the new biotech product having a direct impact on the quality of his life. In fact, the real prosthesis generates a special waveform acting through sensors plug on certain nerve endings of sectional muscle of the patient  . In order to achieve the waveform, Matlab-Simulink was used because the software can provide all the blocks needed to achieve waveform  . Parameters corresponding to a waveform of an electrical neurostimulator can be found in Figure 1. The mathematical model that defines the waveform was achieved using Simulink continuous type library elements. 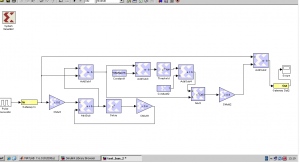 Once developed this model, it is implemented using Xilinx elements. These elements are integrated into Matlab environment with Xilinx installation (it should be noted that installations order matters: first to install Matlab and then to install Xilinx). no longer use continue components, but we will only use discrete components . The result, implemented using Xilinx blocks, is shown in Figure 2. Simulation results (in Matlab) of this model can be viewed in Figure 3. As it can be seen, the Figures 1 and 3 contain the same waveform, so that the model developed can be practically implemented using a development board Spartan 3E1600 . Figure 2. The corresponding model realized in Xilinx technology. ASTROM, K. J., B. WITTERMARK, Computer-Controlled Systems Theory and Design, Ediţia a 2a, Prentice Hall International, 1990, ISBN 0-13-172784-2. ESPOSITO, R., Digital Signal Processing: A Hardware Based Approach, Proceedings of the Middle Atlantic Section Fall Conference of the American Society for engineering Education, 2007. GOLDEN, J., A. VERWER, Control System Design and Simulation, McGraw Hill, 1991, ISBN 0-07-707412-2. GROUT, I., Digital Systems Design with FPGAs and CPLDs, Elsevier, 2008, ISBN 978-0-7506-8397-5. HAMAKER, C., Optimization of Constrained Quadratic Function, Studies in Informatics and Control, vol. 8, issue 1, 2009. MOEZ BELHAOUANE, M., R. MTAR, H. BELKHIRIA AYADI, N. BENHADJ BRAIEK, An LMI Technique for the Global Stabilization of Nonlinear Polynomial Systems, International Journal of Computers, Communications. & Control, vol. 4, no. 4, 2009, ISSN 1841-9836, E-ISSN 1841-9844. POBORONIUC, M., C. D. POPESCU, B. IGNAT, Stimularea electrică functională. Controlul neuroprotezelor (Functional Electrical Stimulation. Neuroprostheses Control), POLITEHNIUM Publishing House, Ia?i, 2005, ISBN 973-621-133-9, pp.180. REYNERI, L. M., F. CUCINOTTA, A. SERA, L. LAVAGNO, A Hardware / Software Co-Design Flow and IP Library Based of Simulink, IEEE research paper from IEEE library. *** XILINX Inc., System Generator for DSP Performing Hardware-in-the-Loop with Spartan 3E Starter Kit.